BANGKOK, Thailand (CNN) -- At least 113 people, including more than two dozen soldiers, have been injured as violence in the streets of Thailand's capital continues to intensify, emergency personnel said Tuesday. 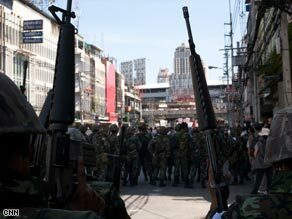 A wall of heavily-armed Thai troops closes in on protesters in central Bangkok. Two people died Monday during a fight between anti-government protesters and Bangkok residents, Prime Minister Abhisit Vejjajiva said in a televised address. Earlier, former Prime Minister Thaksin Shinawatra, whose supporters have engaged in escalating clashes with Thai police, reiterated Monday that he is willing to return to his country but would not say when. Thaksin would not say when he might return. Earlier, he had asked his supporters to "come out for a revolution," saying he would lead them in a march to the capital if necessary. He fled Bangkok last year while facing trial on corruption charges. Thaksin spoke to CNN as clashes between protesters and police intensified Monday, the beginning of the Thai New Year. "The first objective is to clear up the traffic blocks around the city," said Panitan Wattanayagorn, a Thai government spokesman. "The second is to return the government offices and compound back to the officers. Lastly, reduce the threat to the prime minister and his cabinet ministers." The Thai New Year, or Songkran, began Monday and is traditionally a multi-day celebration in the country. People roam the streets, drenching one another and passers-by with water guns or containers of water. This year, however, thousands of "red shirt" protesters -- so named for their clothing -- have rallied for days, saying that Abhisit's 4-month-old government is not democratically elected and that he should call new elections. The demonstrators have given the prime minister repeated deadlines to resign, but those have come and gone. "He insists under the circumstances, where there is a lot of deep division in the society ... resigning won't solve any standing conflict," Panitan said. On Sunday, Abhisit declared a state of emergency in Bangkok and surrounding areas after the protesters forced the postponement of a summit of Asian leaders in the southern coastal city of Pattaya, embarrassing the government. Protesters took over two gas tanker trucks Monday, slashed the tires of a police van and surrounded the prime minister's office, which seemed devoid of any security presence. The government, which had appeared unable to order the army or police to use force in tamping down the protests, set up a "center" Monday with the heads of the police, army, air force and navy to coordinate a response, Panitan said. "We're trying as best as we can to go on with our daily lives, and we are hoping that our prime minister is able to resolve everything peacefully soon," resident Supatra Jenstitwong said. The protesters are loyal to Thaksin, who was ousted in a 2006 coup. The government has blamed him for fomenting the latest clashes. "Now that they have tanks on the street and the soldiers are coming out, so it is time for the people to come out for a revolution," Thaksin told supporters, speaking by video link from an unknown location. Immediately after Abhisit's state-of-emergency declaration, dozens of protesters stormed the country's interior ministry and pelted Abhisit's car with rocks, chairs, flags and sticks as he escaped. Protesters climbed atop two military armored cars after lying in the road and blocking their path. A police officer was led away by demonstrators and beaten, said Sathit Wongnongtoey, an official in the prime minister's office. "It's unprecedented," opposition member Jakrapob Penkair said Monday. "I wouldn't say it is a revolution. At least it's a starting point of the people's uprising against the old power." The emergency measure allows officials to arrest and detain protesters without a court order, and to restrict gatherings, authorities said. Bruce Bugajski and his brother arrived Sunday night for a four-day trip to Thailand and were driven to their hotel by a cabdriver with a red ribbon on his dashboard, signifying his support for the protesters. The normally congested highways leading into the city were deserted. "He had a picture of the old prime minister," Bugajski said. "He said that's who he wants to get back to power down here." Monday morning, the scene outside their hotel was calm, a contrast to the images of clashes blaring from their television screen. "Kids were outside squirting tourists with their squirt guns, and some of the tourists were getting into it," Bugajski said. "It's quite a different picture." -- CNN's Dan Rivers and Kocha Olarn in Bangkok and Saeed Ahmed in Atlanta contributed to this report.